Last week I told you about a new, smaller project that I had started using Scheepjes Color Crafter Velvet and I would like to show you what I am making with it. I am making a luxurious warp and I have given it the name “Touch of Velvet”. The yarn is soft and really nice to work with. It has all the benefits of an acrylic yarn such as a sturdy thread and no allergies, but at the same time it feels more fluffy than other acrylic yarns that I have used before. I can’t quite put my finger on what it is. The Velvet yarn also feels different compared to the Color Crafter yarn, it’s bigger sibling, it feels more….. fluffy. I just can’t seem to find a word in my vocabulary. Have you used Velvet before? Maybe you can give me a descriptive word that would describe what I am trying to say. 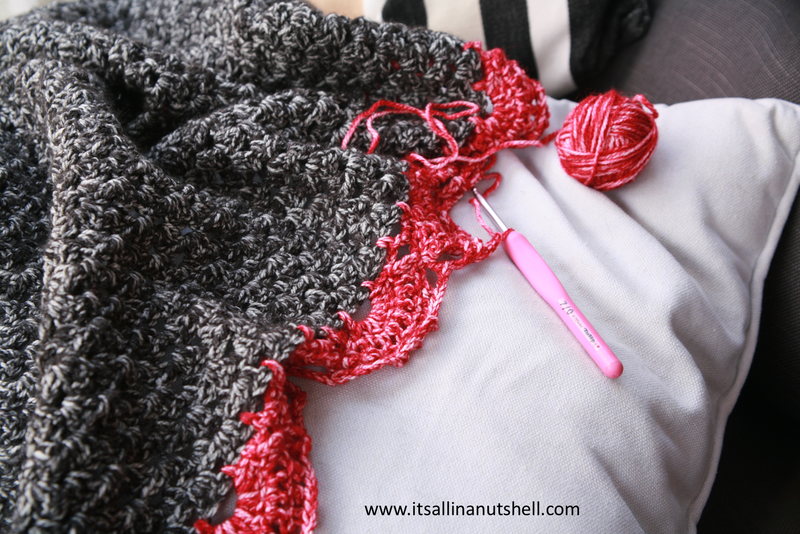 I am making a triangular wrap with a granny stitch base and a lacy border. For the base I am using a deep black color named after Grace Kelly and the border is in bordeaux red named after Humphrey Bogart. Both of these actors are from a generation when I was still a wish in my parent’s minds. With this wrap I am bringing one of my own wished to reality; a design of my very own. And I also have added a small something extra with this design. Can you guess what it is? The wrap works up fast and next week I will show you the end result. Hope to see you then. Well done I love it – always wanted to add beads to something too. The Velvet is certainly softer and fluffier than CC – I used it for some squares in my Dance Under the Stars blanket. Its really lovely. Planning on something for me next with it I think.